In 2003, there were approx. 19.4 million visits to the doctor because of a knee problem. In fact, it’s the most common reason an orthopedic doctor or surgeon is seen. injuries and some may require surgery to fix. Your knee is your largest joint and it’s also the easiest to injury. It is made up of the femur (thighbone), tibia (shinbone) and the patella (knee cap). There are also large ligaments connected to bones that provide support, brace, and motion. The soft cartilage or meniscus that is between the tibia and femur, cushions your knee acting as a shock absorber. 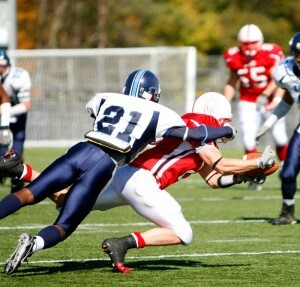 A large number of athletes experience some type of injury to the knee ligaments. Of course, others also suffer such injuries. Let’s look at 4 major ligaments found in your knee that are commonly injured. • Torn Cartilage – Torn cartilage generally is referencing the torn meniscus, which is the tough and rubbery cartilage attached to your knee ligaments. It’s a shock absorber of sorts. It can be torn as a result of cutting, twisting, decelerating, pivoting or being tackled. Often it involved direct contact. • ACL Injury – This type of injury often occurs when landing a jump or slowing down when running. Skiers, football players, basketball players and athletes who wear cleats are at highest risk. It can cause tearing in the ACL. • MCL Injury – These injuries are usually the result of a direct blow to the outer knee. They are commonly seen in contact sports. • PCL Injury – The PCL is often the result of a blow to the front of the knee and is commonly seen when an athlete missteps in the field. Other injuries that are seen include kneecap dislocation, a fractured kneecap, and bursitis. The first treatment option for mild knee injuries is RICE – Rest, Ice, Compression, and Elevation. Resting involves staying off your knee and even using crutches to get around. Ice will help to reduce swelling and the use of a compression bandage will provide support. If you hear popping, your knee buckles on you, there is severe pain, you are limping, you cannot move your knee, and there is significant swelling at the injury. An orthopedic doctor has specialized training and can determine the best course of action for your treatment. Generally, your doctor will begin with the least invasive treatment option first. Knee injuries are no laughing matter. If not properly dealt with they can result in long term problems for you and weak knee that’s more susceptible to re-injury.